Comfortable accommodations and being centrally located near area businesses and attractions are crucial for business and leisure travelers alike. 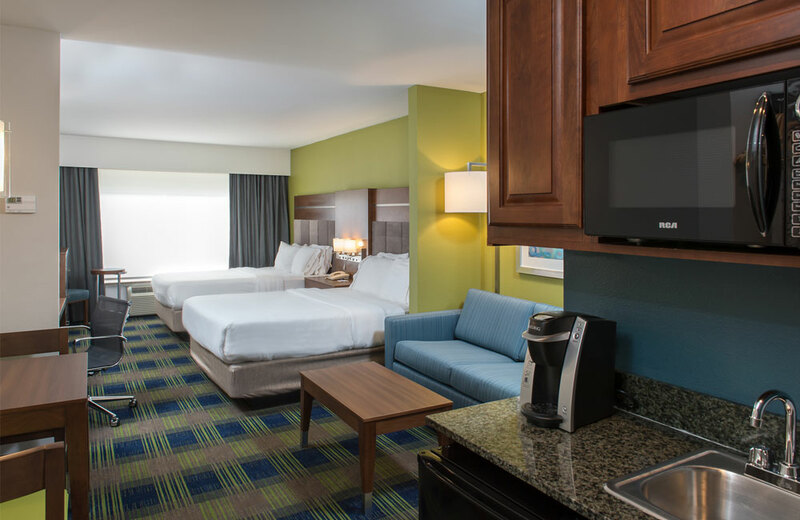 The Holiday Inn Express & Suites in Clifton Park has both, and a fresh, contemporary room design that will appeal to all visitors. 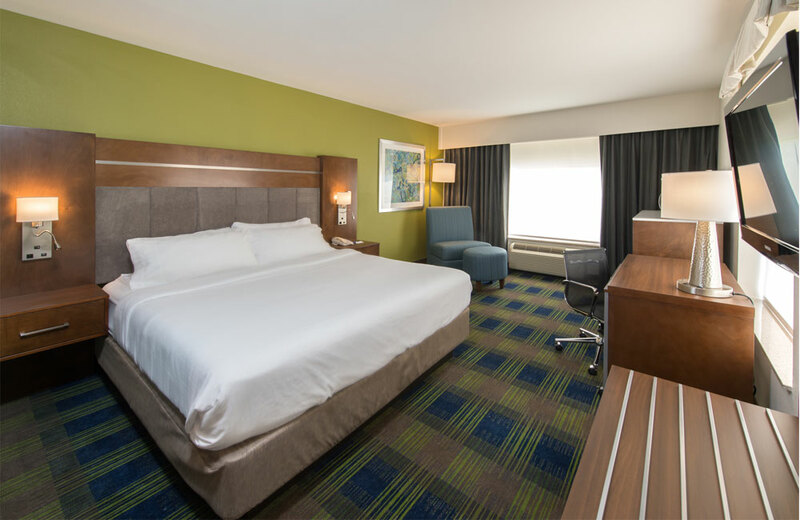 The recently redesigned rooms at the Holiday Inn Express & Suites feature a functional, flexible design that allows for maximum productivity with all the comforts of home. Upon walking into any guest room or studio-style suite, guests first notice bright, modern components. All white bedding and linens are crisp and inviting, the large window maximizes natural light, and traditional drapes have been replaced with more practical window roller shades that pull down and provide a completely dark and private room, when desired. Lighting has been strategically placed to provide fresh illumination that is both welcoming and functional. The mixture of light fixtures, including reading lamps, allows guests to decide how bright they want their rooms to be. A number of multi-functional elements enable guests to arrange their own stay. Seating options are suitable for both relaxing and getting work done. A movable and height-adjustable table can serve numerous purposes. Multiple drawers and an open hanging closet area are available for guests who prefer to unpack, rather than live out of their suitcases. In the bathroom, the spacious vanity offers a fresh area for guests to begin and end the day. 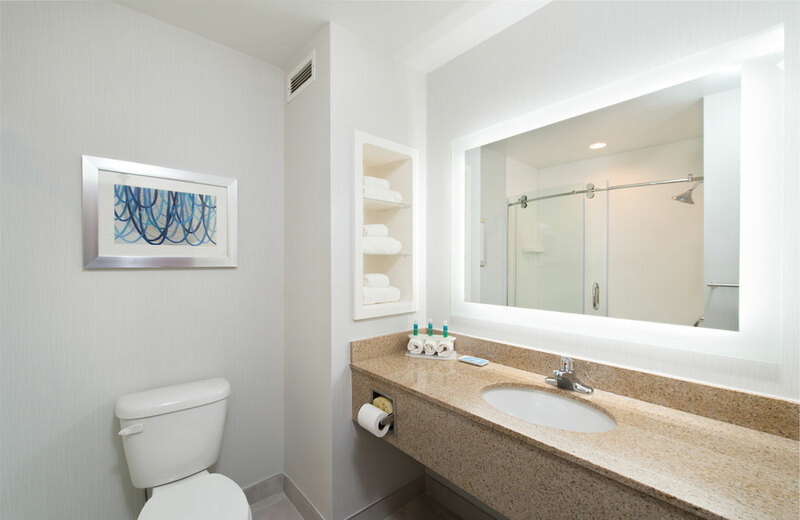 Every bathroom features a stylish and efficient back-lit mirror that simplifies makeup application and personal hygiene. King bedded rooms and suites include a sleek, curved shower with glass doors, offering a modern and refreshing feel for the corporate traveler. Rooms and suites with two queen beds offer bathtubs that are more suitable for families. Since privacy and quiet are crucial, the new rooms feature multiple noise reduction components. Headboards have been constructed with materials to reduce the transfer of sound between rooms. The media tower behind the flat-screen, wall-mounted television is not only decorative, but also reduces TV vibration to adjacent rooms. Each room features a Refreshment Zone with a built-in niche housing an under-counter refrigerator, microwave, Keurig coffee maker, and extra supplies in one central location. A mix of electric outlets and USB ports have been strategically placed next to the bed and at the desk, so guests are never without power for their devices. Stay productive and leave refreshed at the Holiday Inn Express & Suites Clifton Park. Book your stay today, and experience the dynamic new guest rooms for yourself! This article was sponsored by Holiday Inn Express & Suites Clifton Park.